Uber is now dispatching self-driving cars to a select group of users in Pittsburgh and invited us along for the ride. I hailed a car from Uber’s Advanced Technologies Campus Tuesday and took a 45-minute ride through the city’s downtown, eastern and northern neighborhoods. I watched as the wheel turned itself, carefully maneuvering us through crowded streets and around other cars and pedestrians. The two engineers manning the front seats let me “drive” the car back to the Uber campus. Once a light turned blue on the dash, I could hit a silver button in the center console to go autonomous. Braking, accelerating or hitting a red button brought driving back under my control. I took over once to maneuver around a stopped van. The company says it plans to gather feedback from customers who opt into the trial and use it to make decisions about how to expand its self-driving program. It’s just a test run, but it marks the first time that self-driving cars are being deployed in a ride-hailing capacity. Over the course of the morning, there was a lot of talk about safety and innovation, but very little about the future of the millions of drivers across the world that are currently working for Uber. what happens to them? 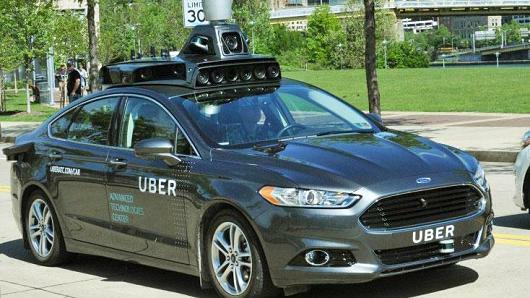 Do they have a future as testers in Uber’s self-driving cars? Unlikely, an Uber engineer told me; those jobs will probably go to employees with special training. Uber drivers are independent contractors with few protections or benefits. The faster Uber gets its driverless cars on the road, the faster all of those drivers will be out of work.